We are excited to announce our brand new customer referral program. The program is designed to reward customers that recommend VEXXHOST to their friends and colleagues. For ever customer you refer, we will provide them with a $10.00 credit on their account. Once they have reached $25.00 in spend with us, we will credit your account with $25.00. Our customers can access our referral program by logging into their customer center and clicking on the “Referral Program” button on the sidebar, as shown on the screenshot below. 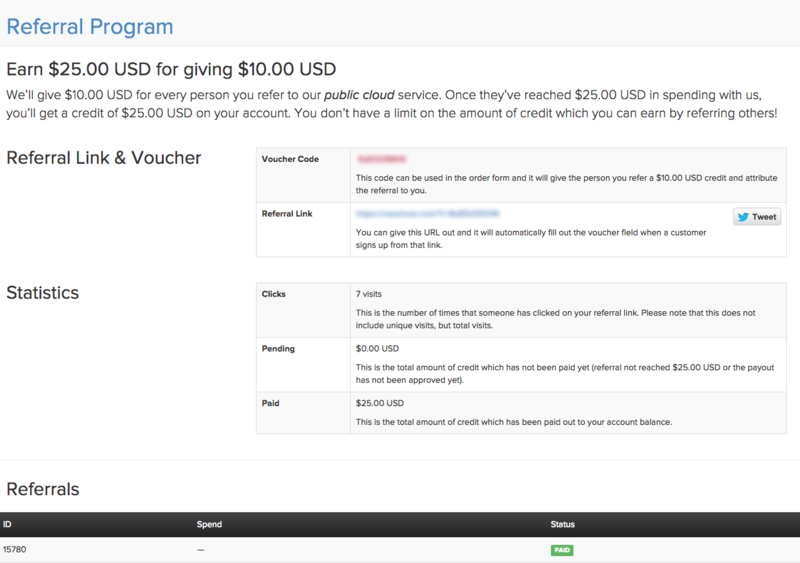 You will be provided with a unique voucher code and link that attributes referrals to your account when used. To ensure maximum transparency with out customers, you will also be able to track all statistics regarding all your pending and paid out sales. There is no limit at all on how much you can make with this! The large majority of our growth has come from referrals so we’re excited to give back to those who support and endorse our service. After all, there is no one who can explain our product better than our own customers. A little bit more about us, VEXXHOST is a high performance cloud solutions that is secure & reliable OpenStack based solutions for Developers & Enterprises. Solutions to support your demanding requirements and workloads used by active customers in over 70 different countries. VEXXHOST was created in 2006 and opened it’s virtual doors as web hosting provider. The advancement of cloud technologies allowed Vexxhost to provide more innovative options such as cloud hosting. The positive response to the leap to cloud based hosting encouraged Vexxhost to invest further cloud based solution. In 2011, Vexxhost adopted OpenStack software for its infrastructure. Vexxhost has been actively using and contributing to OpenStack since it’s 2nd ever release, Bexar. VEXXHOST now offers Public, Private and Hybrid cloud all powered by OpenStack.